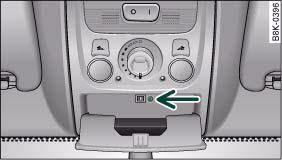 – You can tilt the sun roof open or closed only when the switch is in the 0 position ⇒ fig. 51. – Press the switch briefly to tilt open the sun roof. – Pull the switch briefly to close the sun roof again ⇒ . 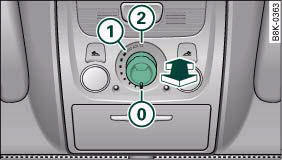 – To set an intermediate position, press or pull the switch until the sun roof has reached the desired position. – To slide the sun roof open to the position for low wind noise, turn the switch to position 1(until you feel a resistance). 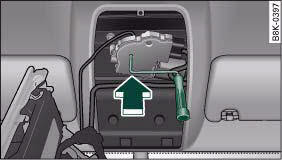 – To slide the sun roof fully open, turn the switch past the point of resistance to position 2 and hold the switch. – To close the sun roof, turn the switch to position 0 ⇒ . – You can set the roof to an intermediate position by turning the switch to the desired position. The sun roof can be operated for about ten minutes after the ignition has been switched off. The switch is deactivated immediately when one of the front doors is opened. The sliding sun blind can be opened and closed manually in any position. The sun blind opens automatically when you slide open the sun roof. When the sun roof is raised to the tilt position, the rear end of the sun blind is raised together with the sun roof. Take care when closing the sun roof. Careless or uncontrolled use of the sun roof can cause injuries. For this reason, always take out the ignition key when leaving the vehicle. You should always close the sun roof when leaving the car. Sudden rain could seriously damage your car's interior equipment, especially the on-board electronic systems. • Should you not be able to close the tilted sun roof, pull and hold the switch until the sun roof is closed. • Details on the convenience open/close function. – Open the compartment for (sun)glasses. The screw ⇒ fig. 52 will then be visible. – Remove the screw and detach the light unit. – Insert the crank all the way into the hexagonal socket ⇒ fig. 53 and turn. The sun roof will now close. To make it easier to turn the crank, you can make use of the screwdriver handle (tool kit).